Sharing our daily bread, in partnership with the Evangelical Covenant Church Of South Sudan (ECCSS) and Covenant World Relief (CWR). In 2006, Community Covenant Church began a partnership with CWR and the ECCSS, providing funding for what was then an agriculture project to relieve hunger in the Sudanese city of Malakal. Through this project our congregation was able to provide funding for farming equipment, seeds, fishing nets, and even new land to grow crops. In 2011, South Sudan split from Sudan after a decades-long civil war and became the world’s newest country. In 2013, after two years of tenuous peace, South Sudan fell into a new civil war, political and tribal conflict erupting between the president and vice president and their respective tribes and followers. Now, amidst the violence and horrible conditions in South Sudan, most of its citizens have had to flee to refugee camps in Ethiopia, Kenya, or Sudan. The ECCSS has shifted their focus towards relief efforts, and our donations go towards encouraging peace and making things better for vulnerable women and children in refugee camps who have had to abandon their country and their lives. 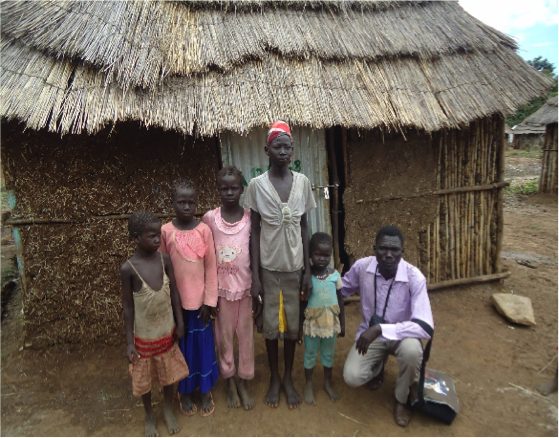 Simon, VOC Officer, with a family of five children who are beneficiaries in the VOC project. Left to right, Nyajouk (6), Nyanyier (8), Nyapan (10), Chol (13), and Nyadech (4). There are two different branches of the relief efforts undertaken by the ECCSS which are funded by donations from our congregation and Covenant World Relief. The first of these is the VOC (Vulnerable and Orphaned Children) Project. The funds allocated to this project go toward school fees, uniforms, and medical care for orphans and other vulnerable children in the camps, both boys and girls. Currently there are over 100 children in the program. The project also provides basic relief supplies such as food, mosquito nets, and clothes to people who need them. Finally, the project provides vocational training and micro-loans to widows, giving them a way to earn a living in their community. Many of these widows in turn support and care for the children in the program and others in the community using the revenue brought in by their new businesses. 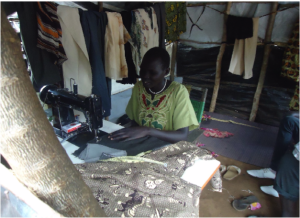 Nyahok, a widow who is part of the VOC program, sews clothes at her small shop in the Kule 2 Refugee camp in Ethiopia, which she was able to open after receiving vocational training. The second branch of the ECCSS relief efforts is the Peace and Reconciliation Project. 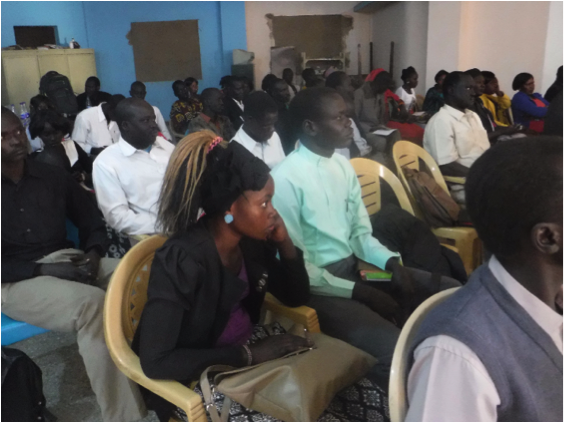 The ECCSS is committed to spreading peace and healing in South Sudan from the ground up, and holds Peace and Reconciliation workshops as part of this effort. These workshops, held in cities and refugee camps where there are large and diverse South Sudanese Communities, aim to bring people from different tribes together and heal the animosity between them. Since most of the violence and fighting in South Sudan has been either caused or exacerbated by long-standing tribal conflicts, these workshops are important because they encourage an attitude of collaboration and peace between ordinary South Sudanese citizens. Through bible studies, seminars, and group workshops, The participants are sent from the program as “ambassadors of peace”. They leave with a mission to be “peace builders and peacemakers”, and go back to their communities with the aim of spreading what they have learned to others. The hope for these workshops is that they will help to shape the stability of South Sudan as a nation and ease the transition from war to peace. Participants attend a seminar in a four day workshop held in Khartoum. Regular prayer, both individual and congregational. Donations, of any amount and frequency. We hope you will prayerfully consider participating in the partnership between Community Covenant Church and our brothers and sisters in South Sudan. “For I was hungry and you gave me something to eat, I was thirsty and you gave me something to drink.” —Matthew 25:35.